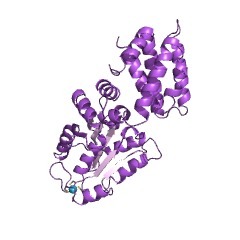 Polbase - Reference: Crystal structure of the delta&#39; subunit of the clamp-loader complex of E. coli DNA polymerase III. The crystal structure of the delta' subunit of the clamp-loader complex of E. coli DNA polymerase III has been determined. Three consecutive domains in the structure are arranged in a C-shaped architecture. The N-terminal domain contains a nonfunctional nucleotide binding site. The catalytic component of the clamp-loader complex is the gamma subunit, which is homologous to delta'. A sequence-structure alignment suggests that nucleotides bind to gamma at an interdomain interface within the inner surface of the "C." The alignment is extended to other clamp-loader complexes and to the RuvB family of DNA helicases, and suggests that each of these is assembled from C-shaped components that can open and close the jaws of the "C" in response to ATP binding and hydrolysis.